The early leaders were SA but NSW soon took over the lead. By about the 800 metre mark, the Victorians surged to get up level with NSW. For the next 7-800 metres these three crews were locked together in a great battle with the others crews in their wake. In the last 500 metres, the battle was between NSW and Victoria with Victoria coming home victors by 0.3 seconds in a great race. This was a convincing win to Ted Hale by 9.77 seconds. As with most of these championships, the racing was fierce. At the 500 metre mark SA held a narrow lead and by the 1000 metre mark WA held a slight lead. At the 1500 metre mark three crews stood out, NSW, WA & Victoria in a great struggle. 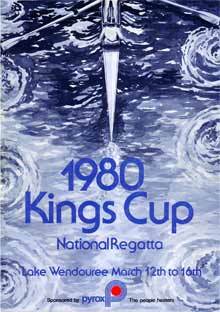 NSW was the dominant crew in the last 500 metres breaking the Victorians 9 year hold on this championship. A tight struggle developed for second placing with WA prevailing over Victoria by 0.03 seconds. The Victorians established an early lead which they held throughout the race. A strong challenge by WA in the last 500 metres was only just withstood with WA finishing a narrow second placing. A strong performance by Victoria who led all the way and finished with a large margin. Renouf won by 2.72 seconds from fellow Victorian Hoffman with a large margin back to third. This was a closer Championship than the four and scull but still a good win by 2.40 seconds for Victoria.